We talk about wealth a lot here (if you didn’t notice, it’s part of the name). But, wealth means a lot of things to different people. A person may tell you having a healthy family is being wealthy (I don’t disagree, but that ain’t what we are talking about). Another may say it’s your salary. And that one cousin, who doesn’t act right, may tell you it’s waking up in a new Bugatti. The truth is, there is only one true measure of wealth: net worth. There are many ways to measure financial health. Income, retirement savings, stock performance, and debt ratios are all used. All of these are important things to understand, but only one number takes all them into account in a fair and easily measured way, net worth. Let’s start by discussing financial health. 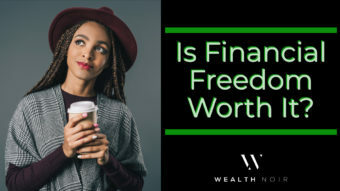 At Wealth Noir, we firmly believe in financial freedom and generational wealth as the end goal of building wealth. 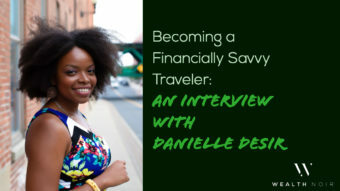 Financial freedom is important because it means at any point you can retire, survive a layoff, take a year off to travel the world, or quit to be with your children and not worry about money. Generational wealth is reaching a point where your wealth can have an impact beyond you, whether paying for your grandchildren’s college tuition or an endowment to leave a legacy. Additionally, if you have generational wealth, your financial freedom is insured against any type of hardships (yes … it’s that much money). These are the goals we support and preach. So, when put like that, the other measures of wealth don’t hold up. Income, maybe. But even $500k a year isn’t enough when your spending is out of control. 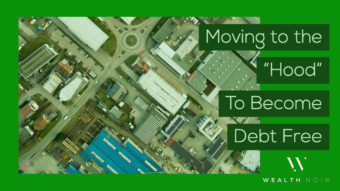 Keeping Debt in check is important. But, a person with no debt, may still have no assets and little wealth. A good Credit Score just means you pay your bills. Really … that’s it. Your net worth is the true measure of how much money you are worth. You get to determine what number is the right goal for you, but net worth is the only measure you can trust. If it increases over time, it’s 100% guaranteed you are becoming wealthier. And, if you still aren’t sure, see what Investopedia, The Huffington Post, or Money magazine, have to say. Simple. Net worth = assets – liabilities. It’s a basic equation. Easy enough for anyone to calculate. 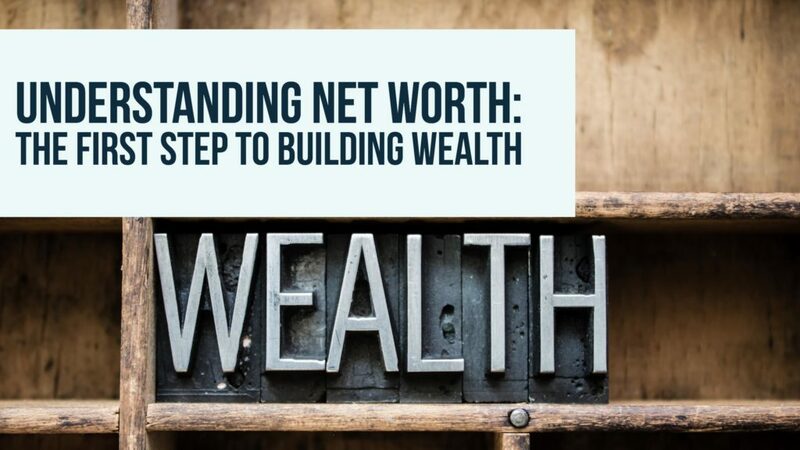 Now that you are already sold on the importance of your net worth, let’s understand what goes into the number. Assets are the things you own that are worth money. The “worth money” part is important because you need to be able to turn the item into cash (liquidate) for it to count. Real estate, stocks, bonds, cars (their current aftermarket used value), and bitcoin are all examples of assets with real value. If needed, they could be turned into liquid assets (aka cash). Liabilities represent the money you owe. 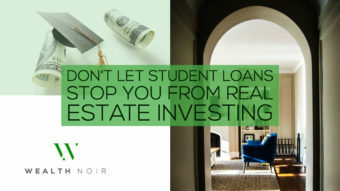 This includes your mortgage, credit card debt, student loans, car loans, and other forms of debt. This is the money you have to pay at the end of the day. Make sure to split things that are both an asset and liability, like a home and the mortgage. 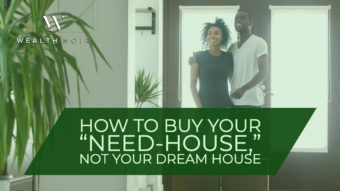 I’ve seen too many people happy to include their home value and quick to leave off their mortgage. 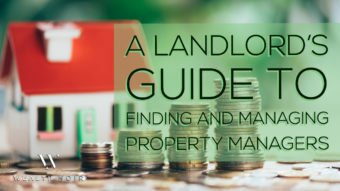 In addition, take into account any costs needed to sell the asset. Did you know the standard realtor fee to sell a house is 6%? That means your real estate is worth 6% less than what you think. Similar with traditional 401ks or IRAs in that you have to pay taxes on them, which is 15% to 30% of the value gone immediately. There are many tools and services that will automate this and do it automatically. I personally use Personal Capital almost daily to check my net worth. But to start, I think everyone should start with an excel sheet or pen & paper. Yes … those old-school things we used to use in school. Manually calculating your net worth allows you to really understand all of your assets, forces you to access and check on your accounts, and allows you to modify things a tool won’t pick up. Lastly, when you move to an online tool, it will help ensure you cover all of your accounts. Trust me, this will be easy. Starting with your liabilities. This is credit cards, student loans, car loans, home mortgages, and personal loans. It doesn’t matter whether it’s Chase or your cousin Ray or if it’s in deferred … if you owe money it goes on the list. Next, come up with this same list of all your assets. 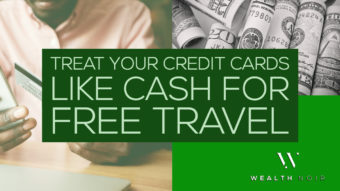 All your cash (checking & savings accounts), retirement accounts (401ks, 403bs, and IRAs), brokerage accounts, 529 savings accounts, etc. Just the accounts. After you have the accounts, it’s time to add high-value possessions. Think houses and cars, not Chanel and Gucci. Jewelry can count but aim for a value of $3,000 or more if you sold. Now it’s time to log-in to all of your accounts online and look up their value. If you don’t have an online access for an account, create it now. Quick access to these accounts is important in the long-term for building wealth. For your liabilities, look for the current balance or payoff amount. This represents how much you owe. For your assets, you want the overall balance. These numbers should be pretty front and center, but some loan sites may require a little digging. 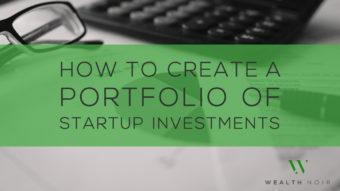 For your valuable assets, you need to come up with a market value. Be honest here! Don’t use the price you paid or what your friend told you. Kelley Blue Book can help value your car and Zillow can help you with the value of your home. There are several tools on the market that can do this. I have personally used Mint.com, Wealthfront, Learnvest, and Personal Capital. After trying them all, Personal Capital remains my goto for tracking my net worth. They take a look at your current worth, how much you add each year, and allow you to add in life events (like having a child) to predict where your net worth is going. Then, they will simulate various market conditions to predict how much you’ll have every year given different market conditions. 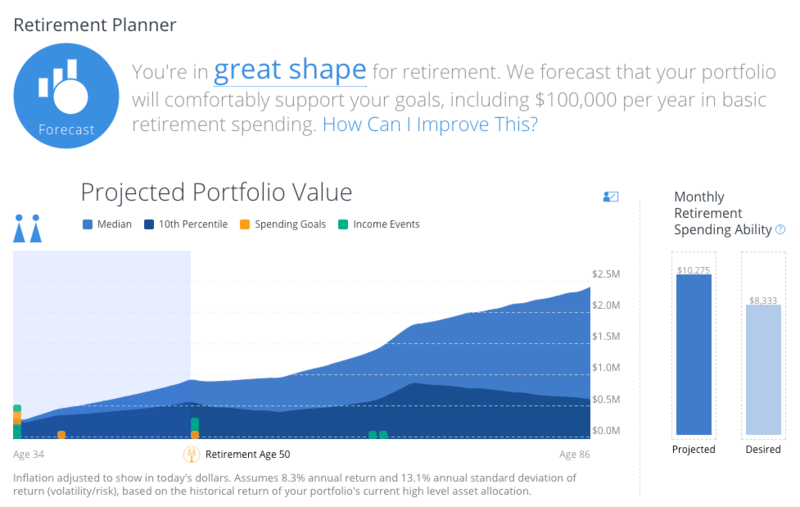 It’s not perfect, but very good and I use it regularly to make sure I’m on track for my outsized wealth goals and it’s the best net worth simulator I’ve come across yet. They look at the accounts you entered and tell you how much you are paying in fees. I use this to check my accounts and have moved my money based on the reports to lower fee providers. This can be annoying to do manually because of an individual mutual fund and ETF fees. How much of your money is in US stocks vs bonds vs cash? What about Healthcare vs Energy? They actually go into your funds, break down the assets inside, and add them up. 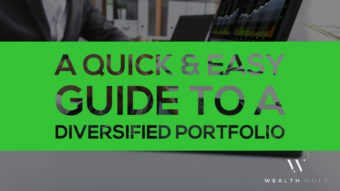 I use this to ensure I haven’t drifted too much of my money into a single asset class. On top of these, there are a lot of other things I use all the time. Their app is easy and lets me check my wealth on the way to work. They will automatically look up the value of my real estate and include it in my net worth. They also track spending and income, tracking your monthly cash flow. All kinds of stuff. If it wasn’t obvious, I am a big big fan of Personal Capital. Setting things up can take some time, but it’s a one and done process. This is easy. Sign up. Enter your details. Login. Remember all those assets and liabilities we wrote down before? All those online accounts we logged into? Well, they all go into Personal Capital. I used to be very nervous about handing over log-in information (OK … I still am), but I’ve used several services over the years and they mostly rely on 3rd party companies with a lot of security to protect the information. I personally have not had an issue and enjoy the convenience. Some accounts may not connect, so you will need to add a manual account instead. You can put in cash, stocks, or anything else and have them taken into account. Every time you log-in, your net worth should be front and center. In addition, a chart will show all the changes over the last 3 months. I don’t expect everyone to check their net worth every day, but I do. It’s so easy after you get setup and it’s motivating for me to see it moving up as time goes on. It also helps me spot weird charges and get them reversed or disputed. Need More? We Got You! We just launched a free 10-day “Know Your Net Worth” challenge to understanding your net worth. 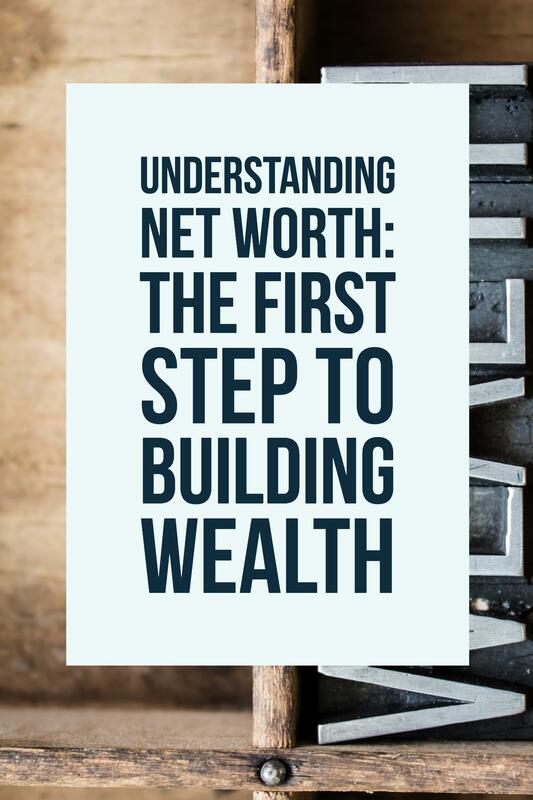 Understanding your net worth is a mission-critical step in building wealth … since wealth = net worth. We created a 10-day email course to challenge you to understand, start tracking, and grow your net worth. 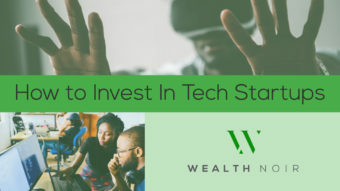 In just 10 days, we’ll explain net worth in normal and understandable terms, help you (again) to track and measure it, and then give you some ways to start growing it. 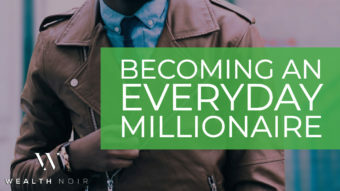 We’re really excited to launch this and want to help you start your journey in wealth. 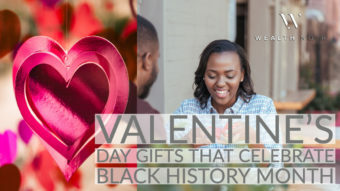 Finally found a blog and article that is targeted towards people like – A black young millennial (early 20s)… very useful article. We’re happy we found you. After too many years of thinking “I wish someone would have taught this to me” … I decided to make a place where we can teach each other. Hey Damien I’m looking for a real estate mentor can you help? Hey Sterling. 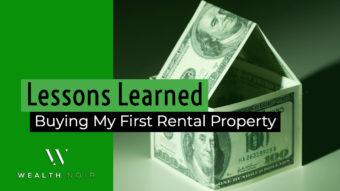 I haven’t done any formal mentoring in real estate before, but open to talk more about what you’re thinking. You can email me. Thanks for the comment Layla. But, as for Wealth Noir, we don’t take a strong stance on this and want people to make the decisions that are best for them. I think it’s important people choose what’s important to them. 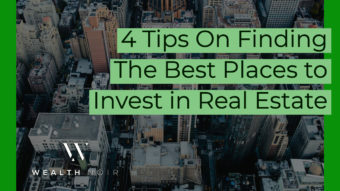 We know everyone values different things and while we clearly stay away from anything objectionably bad or fraudulent, we do stand behind all the recommendations we make as good sound investments. I signed up for the 10 Day Challenge, and verified my email – but nothing happened. Sorry for the delay, but we just checked on our end Jazmin and everything looks good. You can reply to directly to us using any of the emails we’ve sent to reach us quicker.